The JVP’s serial killer ‘Gamini’ - short, stocky and a psychopath whose lust was satiated when he saw the blood of his victims - continued on his bloodletting spree of 43 murders. When only eight days were to go for the Presidential Election, on December 12, 1988, a DJV cadre ‘K’ called on the two of them and announced that ‘Gamini’ and ‘H’ were required to participate in an attack on the maximum security Magazine Prison at Welikada in order to secure the release of JVP terrorists who were being held there. The owner of their safe house was ‘J’, a Malay who was a security guard at the CWE. He too, was a subversive, about six feet tall and 45 years of age. He had been arrested by the Police in connection with the slaying of a UNP Provincial Council Member at Handapangoda. A pistol had been found in his possession. The CWE security guard was married with two children. The senior DJV cadre ‘K’ then briefed ‘Gamini’ and ‘H’ on the details of the attack on the Magazine Prison, planned for the following night - December 13, 1988. ‘K’ told ‘Gamini’ and ‘H’ that they would be given weapons and directed to wait at certain points. When a prearranged signal was given they were to open fire at the Security Forces personnel guarding the Magazine Prison. The subversives inside the jail would breakout by breaching the building’s wall during the firefight. There would be several other JVP hit squads taking part in the attack. 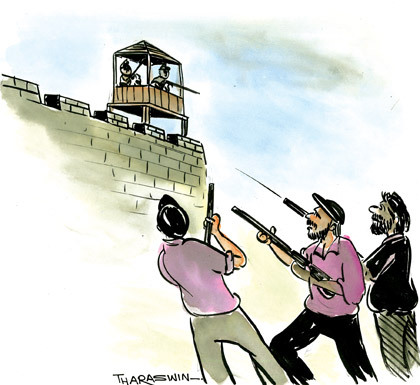 ‘Gamini’ and ‘H’ were to attack the Security Forces sentries at the rear on the Wanathamulla side of the Prison. Escape vehicles for the other hit men were ready. ‘Gamini’ and ‘H’ were asked to hijack a bus and arrive for the attack in it, so that the two of them and the escaping prisoners could make their getaway in that vehicle. ‘K’ then told the serial killer and his subversive buddy to be at a spot near Ayurveda Hospital at Rajagiriya the next morning. As instructed, the two left their safe house at Godagama at 7.00 a.m. on December 13, 1988 on a Honda 125 motorcycle for the crucial meeting. Another subversive arrived on another Honda motorcycle and asked the two of them to follow him, taking in the route and the landmarks such as a playground and the narrow rail track, and also the place to park the bus and the place to where it was to be driven to after the jailbreak. They were told by ‘R’ that the prisoners would follow the rail track and come to the bus in which they were to escape. After riding past the Magazine Prison, they arrived at Wattegedara near Maharagama using the escape route through a network of back roads. It was now about 11.00 a.m. ‘R’ then asked the serial killer and ‘H’ to come with the bus they were directed to rob near Lido Cinema in Borella. ‘Gamini’ and ‘H’ then had a brief conversation on as to how they were to obtain a bus. It then occurred to them that there was a bus in Meepe, Homagama. The two hit men then proceeded to the safe house they had stayed in earlier, and then to the home of ‘Ar’, another subversive, to consult him. But, he was not at home. The two finally reached the safe house at Godagama owned by the CWE security guard at 4.00 p.m. It was now two hours to meet their deadline. As usual, ‘Gamini’ was as steely-nerved as ever, but there was an anticipatory tingling he felt as he thought of that night. And the adrenalin in his body began to flow. They parked their motorcycle on the verandah of the safe house and left for Meepe. They walked up to the home of the owner of the bus. It was now at the height of the fear psychosis and this announcement sent shivers down the spine of the bus owner and his family. ‘Gamini’ continued, “We need a vehicle.” There were a bus and two vans parked in the premises. The bus owner’s wife then handed ‘Gamini’ the keys to the white Tata Benz bus. ‘H’ sat at the wheel with Gamini seated just behind him. They then drove to ‘Ar’s house and handed the revolver ‘Gamini’ was carrying, to him. The two terrorist killers then drove in the bus to the pre-arranged spot, near the Lido Cinema in Borella, sharp at the appointed time of 6.00 p.m. The two got down from the bus, went to a nearby hotel and drank a cup of tea each. Soon, ‘R’, one of the two ‘controllers for the job’ arrived with another subversive. Next, ‘U’, ‘P’, and ‘G’ - all DJV hit men - arrived. ‘R’ then took the keys of the bus and asked ‘Gamini’ and ‘H’ to walk along Dematagoda Road from the Borella junction, passing the front entrance of the Magazine Prison and take up their positions at its rear on the Wanathamulla side, a stone throws’ away from the P. Sarawanamuttu Cricket Stadium. The group of five JVP terrorists stepped into a tea kiosk just past the Magazine Prison on Dematagoda Road. It was now 7.00 p.m. and although the time for the attack on the maximum-security wing of Sri Lanka’s largest prison was fast approaching, they were still sans any weapons. They stepped onto a by-road leading to Wanathamulla and waited there. Then, suddenly, a skyrocket lit the night sky, its yellow beams hovering over the prison. Gamini was now for once filled with fear, for evidently, the attack had been launched and he had no gun. And, without a gun, he was just another man of clay - naked and very vulnerable. Then, a van turned from the main road and moved towards Wanathamulla. The white Hi Ace van was driven by ‘W’ with ‘A’, a very senior JVP cadre and Politburo member, seated beside him. ‘A’ was later found to have been the key link between the political and military wings of the JVP. The five waiting terrorists then began walking towards Wanathamulla and reached the rail track where they found the Hi Ace van parked. ‘B’, one of the subversives who had arrived earlier with ‘R’, joined ‘Gamini’ and ‘H’ at the Borella junction, pulled out a bag usually used to pack fertilizer and two smaller ones and handed them to the others. The group then walked along the rail track for a short distance and opened the bags. ‘B’ then handed a much-relieved ‘Gamini’ and his terrorist sidekick ‘H’ each a T-56 semiautomatic rifle with two magazines containing 40 highly lethal bullets. The three others were given Molotov Cocktails (petrol bombs), another terrorist who had joined the group was handed a T-56 and two rifle magazines. ‘Gamini’ then heard the rear wall of the Magazine Prison cracking ahead of them. The group of terrorists led by the JVP’s No. 1 serial killer ran in that direction. Gamini was now armed with his favourite weapon - the T-56 semiautomatic rifle - and he felt the adrenalin pushing through his veins. ‘B’ then pointed out a security tower inside the jail. The killer’s fingers then pressed the trigger of the powerful gun and pumped several bullets into the security tower. ‘Pr’ then threw the Molotov Cocktails he was carrying over the prison wall. The security guards in the tower returned ‘Gamini’s fire. Then ‘H’ and ‘As’ too, opened fire at the tower which was the strongest point of the jail as it had a complete overview of the prison and the area surrounding it. However, ‘As’ and ‘H’ called out to the fellow subversives inside the jail to come out. The security guards in the tower had ceased firing, either for want of ammunition or being knocked out. Anyway, they had been neutralized. Since the attack had been launched from several points and ‘Gamini’ and his group did not know how the others were fairing. The group kept shouting to the inmates to break out of jail and they began moving along the rail track. They found the Hi Ace van with ‘R’ inside it. The group got into the van carrying their weapons. Two of the group were missing, presumed dead. As their vehicle began moving, they saw the bus, which had earlier been taken by ‘Gamini’ and ‘H’ from Meepe proceeding ahead. The van followed the bus and soon came onto Cotta Road. ‘Gamini’ told ‘H’ who was driving the van to overtake the bus. They overtook the bus at Nawala junction and stopped it. ‘Gamini’, ‘H’ and ‘Pr’ got inside the bus. They had left their weapons in the van. There was not a single escaped prisoner in the bus, there were only the driver and another terrorist. The prisoners, when the bombs were being thrown inside the jail, had escaped through the openings in the collapsed walls, instead of running into the bus in their haste. Soon, the bus arrived at the Nugegoda junction around 8.30 p.m. and the terrorist driving the bus got off there. ‘H’ took the wheel and drove straight to Homagama, where they were stopped at a security checkpoint. ‘Gamini’ and the two other terrorists inside were asked where they were proceeding to. ‘H’ at the wheel replied they were on their way to Godagama. The soldiers then loaded about 30 stranded passengers into the bus, as a bus strike ironically called by the JVP was on at the time. The JVP killers then had to drop the passengers at various points, and also ‘Pr’. Finally, the last passenger had got off at the Godagama junction, blissfully ignorant of the fact that the JVP’s two deadliest killers had given them a free lift, having been forced by the Security Forces to play the role of good Samaritan and in doing so violating a bus strike forced by them on the people. ‘Gamini’ and ‘H’ then drove to Meepe and returned the bus to its owners. The two then returned to their safe house at Godagama. Investigations by the CDB later revealed that of the 221 JVP and 132 suspected LTTE terrorists under detention at the Magazine Prison, 170 JVPers had escaped. However, three had been fatally wounded when another bus in which they had been getting away, was shot at by security guards. Several security guards too, sustained injuries. Investigators also found that months earlier, the JVP inmates had been given permission to hold an exhibition and they were allowed to speak to visitors. Many of these visitors happened to be senior JVP cadres and the exhibition provided a good opportunity for the jailbreak to be meticulously planned. There were also allegations that some prison staff had come to some sort of arrangement with the JVPers to leave the cell doors unlocked. Hence, when ‘Gamini’ and other subversives surrounded the Magazine Prison and opened fire, the inmates went into action, rushed out of their cells, blasted a wall with explosives which had earlier been smuggled into the prison and staged a massive jailbreak.